I have recently discovered the poetry section in Lanark Highlands Public Library. It is ,in very large part, comprised of Canadian works. 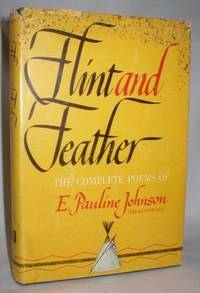 Flint and Feather is the complete collections of poems by E. Pauline Johnson, a native Mohawk. The small book was published in 1912 and the copy at our library is the twenty second edition. Though the poems are from another era they are in no way outdated. In her work she expresses the intensity and passion as well as the tragedy of the lives of her own people. Her poems are powerful and captivating. I just couldn’t get enough. I re-read much of the book, devouring the imagery and emotion. In my opinion Ms. Johnson’s poetry not only rivals but surpasses the works of Frost, Yeats and Keats in its ability to elicit strong reaction and sympathy in the reader. If you read this poetry be prepared to be moved, to have your sensibilities challenged. Like other fine historical novels Munich is part thriller and part examination of a seminal period of the twentieth century. Set in 1938 when the world was on the brink of war and desperate to avoid it. Adolf Hitler threatened to attack Czechoslovakia over what was s ubsequently called the Sudetenland that bordered Germany and contained a large proportion of German speakers. It also, coincidentally, included most Czech border defenses, banking and heavy industrial districts. Chamberlain, to appease Hitler and avoid war through the eyes of one German and one British mid level assistant who happened to attend Oxford together prior to the current tensions. Ultimately an agreement is reached in late September, 1938, signed by Germany, France, Britain and Italy known as the Munich agreement. Czechoslovakia wasn’t included. Chamberlain was seen as a hero and declared “peace in our time”. This is the point where the book ends and all in all is a sympathetic view of appeasement. Even those that aren’t history buffs will enjoy this fast paced read. By the way, Hitler attacked and occupied Czechoslovakia six months later. History hasn’t been quite so kind to Chamberlain. And the rest, as they say, is history. Leroy Ninker has a hat, a lasso, and boots. What he doesn’t have is a horse – until he meets Maybelline, that is. It is love at first sight. There are three rules to follow to keep Maybelline happy. Leroy manages the first two but not the third. Tragedy strikes. Can Leroy rescue the horse of his heart? The fast paced, action packed narrative will have you turning pages to find out. Leroy Ninker Saddles up is cute little chapter book that is perfect for children 8 to 11 years old. The younger ones will be able to read it themselves and the older set will love the easy and entertaining word play that is scattered throughout the book. This is a great book for children and the adults who read to them. The ending is a little quirky, but I loved it. Have you ever lain awake in your tent or cabin and heard the eerie call of wolves? The deep primeval longing and fear associated with that call sends shivers down my spine every time I hear it. Wolves have always evoked both fear and admiration in humans – their only enemy. Their image has changed dramatically through the centuries – from creator and helper to symbol of evil, from predator to prey, from legend to icon. The many legends, myths and facts in Wolf provide a compelling look not only at a remarkable animal, but also at a complex and ever-changing relationship. It is a great resource for students researching wolves as well as an informative read for anyone interested in one of our close neighbours, here in Lanark Highlands.